Conferences can often be seen as dull, stuffy affairs, relating to the inner workings of industry or focusing on the same old team-building exercises in business. They can often be reminiscent of high school assemblies, where the audience is sitting around with the look of boredom in their eyes while the speaker drones along with a jargon-filled speech. But they don’t have to be this way, and one way to do it is to shatter expectations and take to the stage, or the front of the room, with gusto. 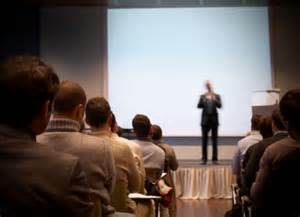 Any conference speaker’s primary goal is to get people to listen with rapt attention, and not doze off or doodle in disinterest. The best way to do this is to grab their attention right from the start. Laughter at conferences can be a great ice breaker, and this can be achieved by telling a funny anecdote or making an amusing observation about the conference setting or its attendees, depending on the crowd. It’s not always easy to make such comments on the spot, so prepare like you would with any public speaking gig, and write up your opening speech and practice, practice, practice before you ever get up in front of that room. Sometimes it’s easiest to sound like you are speaking off the cuff when you know exactly what you’re going to say. If you have difficulty coming up with jokes, then engage the audience from the get-go. Ask them how they’re doing or comment on the weather, like you would with any individual conversation, and have a conversation with the audience. You may even address certain attendees by name and make direct eye contact, to let them know that you’re engaged in this conversation. Better yet, comment on something specific and relevant related to the conference, which will engage any audience member’s attention. It’s also best to practice beforehand so it comes off as natural. However, all the practice in the world won’t necessarily prevent you from freezing up as you step up in front of the audience. Most crucially before speaking at the start of a conference, you must be calm and relaxed, which can be helped by taking deep breaths and with positive affirmations. Once you’re warmed up, your speech will come out naturally, and the audience will have you full attention.